Since the 1920s Meadowood, in the heart of the Napa Valley, has been catering to the whims and desires of the wealthy with quiet elegance. This resort is so exclusive it doesn't even bother to post a sign on the Silverado Trail to announce its presence. Most people in Sonoma County have never even heard of the place. Still, if you're looking for a spot to get away from it all and work on your tennis or golf--and you've got around $500 a night for the tariff--then Meadowood might well be worth checking out. Even if you're not rich, you can still dine in the restaurant or grill and maybe have a shot at meeting that well-heeled potential spouse you've been praying for. Meadowood also features a world-class croquet field. 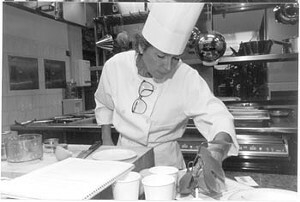 Throughout the year Meadowood's Wine School offers wine and food courses. An elaborate menu of health and fitness activities, along with full spa services and well-being programs, is offered. 900 Meadowood Lane, St. Helena, 963-3646; 800/458-8080.--B.E. A writer's life can be difficult, so it's good to know there's help out there. Now in its 19th year, the Napa Valley Writers' Conference runs July 23-28. Open to participants in poetry and fiction, the conference will feature two Pulitzer Prize-winning novelists: Michael Cunningham and Jane Smiley. Lose yourself in poetry workshops led by Forrest Gander, Brenda Hillman, Claudia Rankine, and David St. John. Not only will this talented bunch read their work and lecture to the public, but they'll teach you how to bring out the muse in yourself. The conference also includes fiction workshops, and scholarships are available. The conference is held at the Upper Valley Campus of Napa Valley College in St. Helena. Cost is $500. Call Anne Evans at 253-3188.--S.L. Sure, your mama told you never to play in it, but you're going to anyway. So slide into a tubful of bubbling brown muck and wallow to your heart's content in the thick earth-scented mud at Dr. Wilkinson's Hot Springs in Calistoga--the volcanic-mud capital of Northern California. An attendant will shovel the heavy glop over your torso so you feel as if you're suspended under a filthy wet blanket. The basis for the traditional mud bath used at Dr. Wilkinson's is volcanic ash left over from the eruption of Mt. St. Helena. It's mixed with the boiling mineral water from the gurgling geothermal well on the property, with a little peat moss added for texture. Top off the relaxing treatment with a warm, tangerine- and lavender-scented mineral whirlpool bath, a steam bath, a shower, and a brief nap, swaddled in cozy blankets. Whether or not you subscribe to the ancient curative powers of soft wet earth, you'll come away believing a little mudslinging sure does a body good. 1507 Lincoln Ave., Calistoga. 942-4879.--P.H. Hop on board the gloriously restored vintage beauty of the Napa Valley Wine Train for a 21-mile tour through the Napa Valley. As if the velvet swag curtains, etched glass, and polished mahogany weren't enough, 1999's Chef of the Year, Patrick Finney, offers a prix fixe dinner menu as well, which begins in the lounge car with appetizers of herbed cheese, truffle mousse, and other delights. Once in the dining car, guests can select from one of four or so dinner entrées. The wine list is solid (of course, this is the Napa Valley), with many selections available by the glass as well as the bottle. The three-hour excursion doesn't come cheap, though; expect to spend around $150. Reservations are required. 1275 McKinstry St., Napa. 800/427-4124.--S.L. As you drive up to Mt. St. Helena's Robert Louis Stevenson State Park, a stunning band of cliffs emerges in the distance: The towering dark gray columns look like a climber's paradise. Don't get too excited, since upon closer inspection it's a pile resembling mud more than rock. The park's quality crags are tucked out of sight, some more than an hour's walk from the parking lot. Fortunately, the best climb on Mt. St. Helena is also the most accessible: no bushwhacking through the ubiquitous poison oak; good bolts for setting anchors. "The Bubble" formation is on the Mt. St. Helena hiking trail, where the fire road makes a sharp turn. The formation's namesake 60-foot climb is a wild ride of overhanging andesite rock, with bucket-sized handholds and scooped-out shallow caves that seem almost big enough to sit in and rest those pumped-out biceps. Once you've pulled your way to the top, be sure to turn around and take in the sweeping view of the Napa Valley.--J.W. 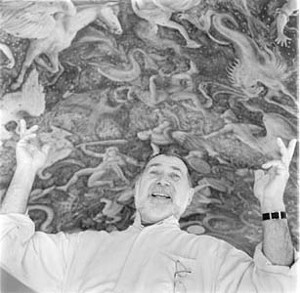 THE CEILING OF CARLO MARCHIORI'S Ca'Toga Galeria d'Arte reminds one of the Sistine Chapel, with its representations of constellations, continents, and mythological figures. The terrazzo floor depicts the complete lunar cycle with the earth in the middle, into which is deeply carved "HIC ES," or "You Are Here." The gallery itself is a work of art with its painted walls, large sculptures, artfully placed windows, and tile work in the walls. The piece that really catches my eye is a 16-square tile work of a parrot painted in a lovely cerulean blue, which is selling for $2,000. Maybe I'll get the postcard instead. Outside, the courtyard is painted salmon, aged stonework abounds, and the pillared portico sets the building back from its overlook of the Napa River. 1206 Cedar St., Calistoga. 942-3900.--S.L. Roaming the streets of downtown Calistoga with a fine beer, ale, cider, or mineral water (all locally made) in one hand and a plump sausage product (also from roun' these hyar parts) in the other is a form of bliss that one cannot often experience outside the Strassenfests of southern Germany, but the annual Calistoga Beer and Sausage Festival captures the feeling and adds a little wine valley flair, too. Vendors, live music, and displays are part of the added fun. $20 gets you in the gates, rain or shine; $10 if you're the designated driver (how PC!). This year's annual festival is slated for Sept. 30, from 11 a.m. to 5 p.m., rain or shine. Napa County Fair Association, Calistoga. 942-6333.--S.L. So, you want to be a wine snob? If you're a rank beginner, the first thing to know about wine is that you don't know much. Sniffing the cork and speaking through your nose about the piquant quality of the bouquet gets you only so far. When you're ready to do some quiet study to back up that big attitude, head over to the Napa Valley Wine Library. Located in the back of the St. Helena Public Library, in front of wide windows overlooking expansive vineyards, this broad collection offers a bit of everything for the studious grape groupie, including such primers as Wine for Dummies, reference books on the science of wine making, and practically every published periodical about wine, including Wine X, American Vineyard, and Wine Spectator. Also on offer: a bevy of wine-related novels and a special 200-volume collection of wine labels from around the world. Finally, if all this leaves you feeling a bit sodden, just crack the covers on the collection's copy of Alcohol and the Addictive Brain. 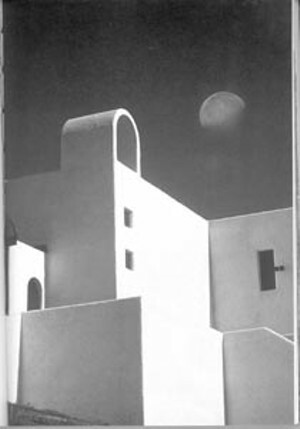 1492 Library Lane, St. Helena. 963-5244.--P.S. Slavering booze hounds drool over tasty cocktails while others guzzle thirstily from giant jugs of wine. The clip art alone tells you The Unofficial, but Honest Guide to the Napa Valley is not your average wine-country newsletter. The eight-page Rutherford zine is full of alcohol-sodden reminiscences, odd little essays by such writers as Dean Martini and Rip Diddley, and fake restaurant ads lampooning the wine country's tendency toward hauter-than-thou cuisine. Alas, you may have a bit of trouble finding it, though. But you can pick it up in coffee shops around Napa County, or contact the publication at P.O. Box 40, Rutherford, CA 94573.--P.S. Love pops up in the most unexpected places. For example, take the Old Faithful Geyser in Calistoga. The stalwart tourist attraction, which shoots a giant plume of hot water into the air every 30 minutes or so, may seem an unlikely spot for romance. But back in 1994, local tropical-fish enthusiast Troy Thompson had a special problem. One of his beloved fish, a Pseudeotropheus zebra female, was not adapting well to captivity. Noticing that the shallow pool around Old Faithful was remarkably similar to the environment of his pet's native home in an African lake, Thompson decided to release his fish into the shallow water. Almost immediately, the zebra disappeared and was presumed dead. Undaunted, Thompson tried again with a male Zebra. As soon as the second fish was released, the female reappeared, apparently full of health. Within a few weeks, the newly vigorous fish had produced a school of baby zebras that were spotted flitting about the pool under the geyser's warm shower. Unfortunately, like many love stories, this one has an unhappy ending. When the management at Old Faithful discovered the pool was now home to an alien species, Thompson was ordered to go fishing and remove both his old pets and their new family. Still, the fishy aura of romance lingers. 1299 Tubbs Lane, Calistoga. 942-6463.--P.S. IT'S NO SECRET that when the politicos in Washington, D.C., want to know what's going on with governmental bodies and holders of high office around the globe, they call upon the CIA. Likewise, when wine country dinner hosts want to serve a truly special dish to guests, they, too, think CIA. Only in the case of the dinner hosts, CIA stands for Culinary Institute of America, housed in what was once a sprawling Napa Valley winery. The CIA Marketplace covers 3,100 square feet of the historic stone building that was constructed in 1889, and it draws chefs from near and far for its selection of cooking tools and cookbooks. More than 1,500 cookbooks and reference books are available, and as one staffer put it, "If you can't find a recipe here, it probably doesn't exist." 2555 Main St., St. Helena. 967-2309.--B.J. Oakville Grocery no longer is a simple country store situated along the Napa Valley wine trail. In recent years it has become a brand and a chain, with no fewer than five locations now dotting the landscape. Still, many thousands of people make annual or more frequent pilgrimages to the original store because of its heritage and the down-home attitude of its staff. This is where picnic-bound visitors stop for fuel of the edible variety (the selection of cheeses and breads is mind-boggling) and where locals stop for the wine country's version of "fast food." Among the inventive sandwich offerings is the house-roasted pork loin with barbecue sauce, red onions, and baby greens on sourdough; it is unlike any sandwich you've ever tasted. 7856 St. Helena Hwy., Oakville; 944-8802.--B.J.